This is an illustration by Adi Oren, a fellow student at RISD, from last semester’s Illustration I class. The project was simply to illustrate being lost in however way we saw fit. Adi’s piece captivated me the most out of all the illustrations that were presented. 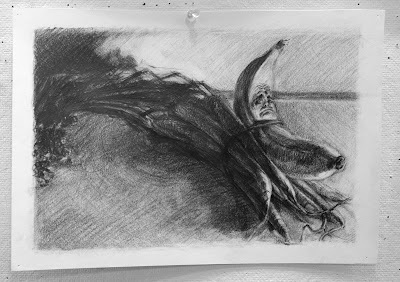 It is a wonderfully unusual concept, executed simply with graphite. The originality of the idea, combined with the sensitivity of the mark making makes for a very touching narrative. What speaks to me most of all is the expression of the banana. It really is its own character with the saddest little face and I feel that it is exactly how a banana would look like should it be animated. The scratchiness of the pencil marks adds anxiety to the atmosphere, and the space, which not defined also speaks of the “lostness”. This illustration captures a moment in a story and leaves the door wide open for the viewer to imagine all the possible narratives leading to this moment, and onward. To me, this is an example of how an original concept and the sensitivity by which it is rendered results in a successful and interesting narrative. I wonder if a more abstract, less narrative approach could work as well in this case.